Recent headlines about horsemeat have led Europe's consumers to give some "beef" products a wide berth - but horse has long been enjoyed in some European countries. In Paris, fashionable chefs have actually been putting it back on their menus. So will more diners now be jumping for the horse tartare? Would you willingly give your children horsemeat hamburgers for their tea? The answer to that in most of the English-speaking world, even before the latest mislabelling tailspin, would have been an emphatic nay. To which the horses would no doubt respond with a grateful one of their own. In France, the response would be more guarded. French horse-meat consumption has been in decline for decades, and today accounts for just 0.4% of all meat eaten. But there are still 750 horse-butchers operating in the country, 17% of the population claim to have eaten horse at some time or another, and about 11,000 farmers continue to raise horses for the meat trade. Professionals say they believe the worst of the decline is over. For the last two years horse-eating has been - excuse the pun - stable. "We have had to endure a lot of attacks," says Yves Berger, president of the National Association of Meat-Producers Interbev. "Every year our opponents mount major publicity campaigns to tell people not to eat horse." "But what we have noticed is the effect of these campaigns is diminishing. More and more, we see that people want to keep an open mind about eating horse - which is as it should be." Coinciding with - and possibly contributing to - this stabilisation of the market is a new gastro-trend among Paris foodies. A handful of chefs have started putting horse on their menus. Go to Les Tontons, for example, opposite the former Paris horse abattoir in the 15th arrondissement, and you can be served a succulent horse tartare (raw horse with egg and seasoning). "Of course, it is perfectly apt because the original steak tartare was horse. The Mongol tribesmen ate their own horses and tenderised the steak under their saddles," says owner Jean-Guillaume Dufour. Actually there is no historical evidence for this, but who wants to spoil a good story? "My mission is to tell the world that you can sit on your meat and eat it too," he enthuses. "Yes I know horses are pretty and friendly and so on. But cows would be, too, if we let them." Other hip restaurants - such as Le Taxi Jaune, Le Verre Vole and Septime - serve horse carpaccio, horse hamburgers with quail's eggs, or straightforward horse steaks. One chef, Bertrand Grebaut, caused a minor sensation at a recent culinary event when he carved and cooked a horse's heart - live on a big screen - in front of an audience of fellow cooks and food-writers. "There's definitely something going on - a kind of buzz," says Dorian Nieto, food blogger, horse-meat aficionado, and author of La boucherie chevaline etait ouverte le lundi (The horse-butcher was open on Mondays), a celebration of horse-eating. "A number of restaurateurs have told me they are checking out where to buy top-quality horsemeat. It's all about a return to old values, a kind of nostalgia. And yes it is all rather trendy and Parisian. But there's a frisson, no question about it." Given how strongly identified France is with the practice of horse-eating, the history of l'hippophagie is actually quite short. In the Napoleonic Wars (1803-1815) it is said that - by necessity rather than desire - French soldiers developed a certain taste for cheval. But it was only in 1866 that horse-eating was permitted by law. Thanks to an alliance of nutritionists, social reformers and, funnily enough, animal welfare supporters, the practice was actively promoted. The 1870-71 siege of Paris by invading Prussians was a turning-point. Many people tasted horse for the first time, as thousands of the animals were slaughtered. It turned out people quite liked it. In the decades that followed l'hippophagie became increasingly popular, with a peak in 1911. Around this time, horses began to be imported because the French market was unable to supply enough. Horse consumption was essentially a habit of the urban working and middle classes. Country people and the rich who had closer contact with the animals were more liable to feel qualms. And overwhelmingly horse-eating was based in two regions - the north and around Paris. After World War II the decline set in, and it became precipitate from the 1980s. Today, it is noticeable that most clients at boucheries chevalines are in their 60s or older, suggesting that young people find the practice difficult to stomach. However butchers like Fabien Ouazan, who has a stall on the Cours de Vincennes market in Paris - are convinced the qualities of horsemeat will ensure its survival. "With horsemeat, you know what you get," he says. "Other animals get fed all kinds of rubbish, but horses eat only oats, barley and hay. "It shows in the meat. So a lot of people who are concerned about health and the quality of meat, are turning to the horse." Horsemeat contains essential amino acids and polyunsaturated fats that help to reduce cholesterol. Compared with other types of meat, it contains greater quantities of trace elements: calcium, phosphorus, iron, sodium, copper, magnesium, silicon, zinc and nickel. It is rich in group B, A, PP and E vitamins. Another argument for eating horse is suggested by Otis Lebert, chef at Le Taxi Jaune. "A lot of horse breeds are disappearing. We no longer have any use for draught horses, for example, or the ponies that went down the mines," he says. "So either we let these breeds die out. Or we preserve them, by eating them." According to Yves Berger of Interbev, large parts of the French countryside are maintained by small-scale farmers breeding draught horses for the meat market. "Without these horses, the fields would go back to forest," he says. 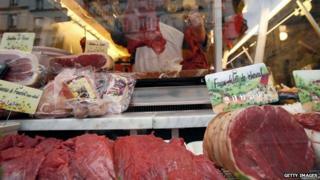 France produces roughly what it consumes in the way of horsemeat (18,000 tonnes a year). But, in fact, most of the meat that is reared in France is not eaten there, but exported to Italy - the Italians (who actually eat more than twice as much horsemeat as the French) like young horses. Meanwhile the French - who prefer older, redder horse-meat - import most of what they eat from the US and Canada, where it is not eaten by humans but is sometimes fed to pets. At Fabien Ouazan's stall, the enthusiasm of the customers is catching. Evidently, none has the slightest queasiness about their choice of nutrition. "I have been eating horse since I was a child," says one lady. "It is very tender, no fat, and full of minerals. "Why should I care that it is a horse? We eat chickens, we eat cuddly rabbits and baby lambs. What's the difference?"